When replacing the batteries in your Xbox One Wireless Controller, use only AA batteries that have an “LR6” designation (alkaline batteries). Install them with their positive (+) and negative (–) ends positions as shown in the battery compartment. For the best performance, rechargeable AA batteries are not recommended. 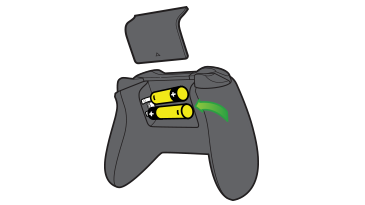 Consult your product manual for all important health and safety information about using batteries with your Xbox One Wireless Controller. Would you like to contact Support regarding the "Using AA batteries in your Xbox One Wireless Controller" issue you were reading about or a different issue?